The goal of this journal is to help the believer hide God’s Word in his heart (Psalm 119:11) and to meditate on it in an effectual, practical way. God doesn’t want His people to read and memorize the Scriptures in a robotic or parroting fashion. Everything is to be done with understanding. See Psalm 47:7; 1 Corinthians 14:15, 19; Colossians 1:9; 3:16. Memorization and meditation go together. By memorizing a verse, the believer can then meditate on it as he goes about his daily life. He can ask himself, what does this verse mean? What are its main lessons? What does this mean for my daily life? 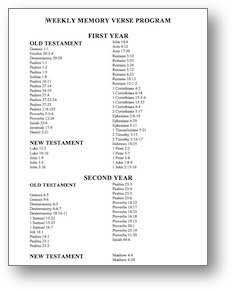 The journal is accompanied by a five-year weekly memory verse program (one or two verses per week). The verses are carefully selected for edification and exhortation. The journal and the weekly memory verse program can be used by individuals, families, classes, and churches. To be downloaded and printed. A printed worksheet will be required for each week. Printable 8.5 x 11 format. - Note that both PDF and Word files are included in the zip file version below.